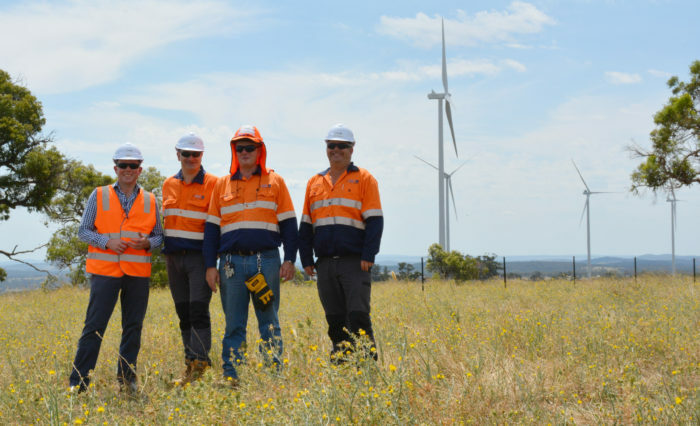 Northern Tablelands MP Adam Marshall, left, with CWP Renewables Environmental Technical Advisor Patrick Millar, Project Manager Andrew Houston and Operations Manager David Williamson at Sapphire Windfarm near Inverell. THE Northern Tablelands is famed for the quality of its food and fibre production, but it’s our region’s electricity generation capacity that is sparking excitement in a new outline for the future of renewable energy production, local State MP Adam Marshall said today. Mr Marshall today announced the region would take the lead in future renewable energy development, as part of a visionary NSW Government plan to concentrate solar and wind farms and pumped hydro projects in key areas across the state. The Northern Tablelands is identified as one of three priority areas for further investment in a submission to the Australian Energy Markets Operation (AEMO). “I’m thrilled that the Northern Tablelands is being recognised formally again for its incredible contribution to our state’s energy mix,” Mr Marshall said. “I’ve long said that our region is the perfect place for wind and solar farms and this submission confirms our vital role in producing the energy our state needs, recognising the incredible investment in our region thus far and identifying room for further growth. “We are quickly becoming the renewables capital of NSW. “The report identifies the potential for 4,000 megawatts of wind capacity, 12,000 megawatts of solar capacity and more than 1,500 potential sites for pumped hydro energy storage. Mr Marshall said new connection-points to the grid were expensive, and concentrating energy generation in priority areas creates an economy of scale that reduces costs. “The New England has been identified as one of three priority areas, helping our region secure a lion’s share of future investment in renewable energy,” Mr Marshall said. “Future developments can link into existing grid connections to high voltage transmission lines, reducing duplication of infrastructure and cutting power costs for end-users. “With the Moree Solar Farm and White Rock windfarm now complete and Sapphire windfarm very close behind, our region already contains some of the most productive renewable facilities in the nation. “Within a few years, the Northern Tablelands will produce 1.51 gigawatts of green energy – a number that will only grow following this incredible mark of confidence in our ability to export power to the state. The two other priority areas are the Central West, centred on Dubbo, and South West NSW, around Hay. Mr Marshall said the AEMO submission reaffirmed the NSW Government’s commitment to renewables beyond its target of 20 per cent green energy by 2020. “The NSW Government is committed to diversifying our energy mix and reducing our carbon production, both for its environmental benefits and for the incredible potential it offers regional communities,” Mr Marshall said. “This submission to Australia’s peak power distribution body shows that planning to 2020 is not enough.